For my creation today creation I decided to feature some of the wonderful NEW Occassions Catalog items! My card features items from the ‘It’s My Party Suite‘ and personally, I plan on getting the entire suite. For today’s challenge I am featuring the Party Wishes Bundle – which includes the Party Wishes Stamp set and matching Party Punch Pack – a trio of party themed punches that match stamps in the set! The Happy Birthday sentiment from the Party Wishes Stamp Set is the focus of my card in Melon Mambo – I just love how it pops off the card! I also added a mat layer 1/4″ from the Mint Macaron card base of Basic Black to really set the card pieces apart. 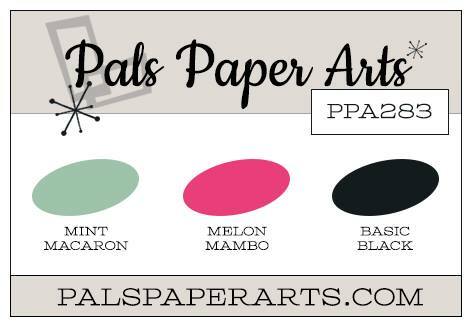 I also wanted to add a bit more pop so I pulled out the wonderful It’s My Party Designer Series Paper Pad and selected the Melon Mambo diagonal stripes print. The balloon stamp and the string stamp allowed me to create balloons around the sentiment, but it still needed just a bit more. I finally settled on the addition of two items – one a punched balloon I created from the Party Punch Pack and then I added some It’s My Party Enamel Dots! This card was so much fun to design – plus this card was a make-and-take at my recent Open House for the new catalogs that went over my guests wonderfully! If you haven’t heard about Sale-A-Bration, which is running from now until March 31st, let me fill you in! With each $50 product purchase (excluding shipping and tax) you can earn a free item from the Sale-A-Bration Catalog! Plus, that’s not all – currently we have 3 items that are only available until February 15th – be sure to place your orders early enough to get your hands on these limited time items! Thank you for visiting my blog today. I hope you stop by again soon! Have a wonderful day! If you would like to receive my newsletter and keep up on all the Stampin’ Jackie news and updates please join my mailing list on my sidebar or email me at jackie.diediker @ gmail.com. Order today at Stampin’ Jackie Shop! If you decide to shop online today with the Occasions Catalog I would appreciate if you could add host code: WJ3RUNWA to your order. PreviousPals Blog Hop – From the Heart! NextPals Paper Arts Challenge – #284! Can we ever get enough of those enamel dots? Festive and fun party card, Jackie! Fun card, Jackie! I love how you've layered the balloons into this design. Great use of these colors! Cute as can be! Fun for a borthday! Fun and happy Jackie! Really loving those dots! It's a joyful birthday card for any age! Love the diagonal stripes!